5.5 x 8.5 inch soft cover novella with 88 pages. Angelique Mott was seventeen when she was deceived and eventually left on her own with no food to survive a frigid winter on Michigan’s famed Isle Royale. Her fight to survive is a heroic epic on the Lake Superior Frontier of 1845 and 46. Writer/editor James R. ‘Jim’ Stevens was raised on a dairy farm at St. Marys, Ontario, Canada. Like many Canadian youth he was a hockey player and in 1960 he went off to Ithaca, New York on a scholarship at Cornell University. He has had published a wide range of non fiction books in Canada that vary extensively in their subject matter. “As an author with the blessing or curse of a Gemini construct in personality many things interest me passionately, however, my bottom line is that a book of mine must have insight and have an enduring quality for readers. 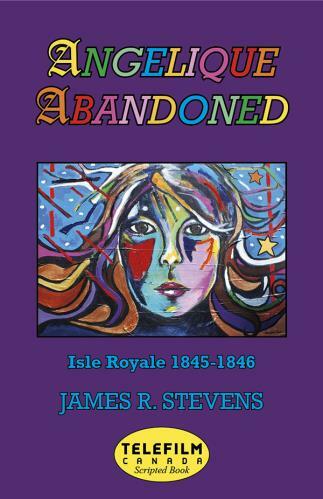 A good non fiction book will be valuable long into the future.” At present Stevens has five books in print in Canada and one of them has been moving off of booksellers shelves for thirty-two years.